The Houston Museum of Natural Science (HMNS) unveiled its newly renovated Burke Baker Planetarium on March 11, and roughly 75 of HISD’s Southmayd Elementary School’s fourth-graders were the first to experience it. Through a long-standing partnership with the museum, all 14,000 HISD fourth-graders take a field trip there each year, but the planetarium now boasts a new seamless inner surface on the dome and a high-resolution, digital-laser projection system so powerful only astronauts will have a better view of celestial objects. This entry was posted in District III - Sergio Lira, Science and tagged Burke Baker Planetarium, Houston Museum of Natural Science, Southmayd ES on March 11, 2016 by HISD Communications. 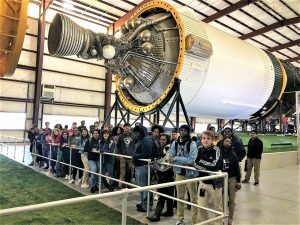 HISD just completed a five-year study with the Smithsonian Science Education Center (SSEC), and the lessons learned from it will be benefitting HISD students for years to come. The study evaluated the effectiveness of the SSEC’s Leadership and Assistance for Science Education Reform (LASER) model of science instruction in three states, using an Investing in Innovation (i3) grant from the U.S. Department of Education. In HISD, the study followed approximately 9,500 students at 26 schools whose academic performance was monitored from 2011 through 2016. This entry was posted in Literacy, News, Science, STEM, Volunteers and partnerships on March 8, 2016 by HISD Communications. The sounds of students hard at work — plotting, drilling, and making deals — filled the room at Houston Community College-Southwest during the Independent Petroleum Association of America/Petroleum Equipment Suppliers Association (IPAA/PESA) Petrochallenge. Nearly 400 students participated in the annual four-day competition, which challenges young people to become leaders in the oil and gas industries through a simulation-based training tool called OilSim. Students from different schools in Houston and Fort Worth not only predicted and acquired valuable blocks for oil and gas production, they were tasked with making deals among the different teams to test their business acumen. In the process, students learn about the methods used in the real world of oil and gas, the terminology used, and maybe even a new career option. “I’ve learned about water depth and geometrics and all this stuff I didn’t know about going in,” said Westside High School student Jason Levine. When all was said and done, three teams of students from Milby and Westside high schools, as well as the Young Women’s College Preparatory Academy (YWCPA), took home the top prizes. Each winning team received a monetary prize, but students say they gained so much more. The Petrochallenge is sponsored by Schlumberger, NExT, Occidental Petroleum Corporation, and IPAA/PESA. This entry was posted in District VI - Holly Maria Flynn Vilaseca, Global Education, Science and tagged IPAA, Milby HS, PESA, PetroChallenge, petroleum engineering, schlumberger, Westside HS, YWCPA on January 26, 2016 by HISD Communications. HISD STEM coordinators, teachers and students will attend the Pumps & Pipes 9 Symposium on Dec. 7 to hear presentations from medical doctors, astrophysicists, research engineers and other Science, Technology, Engineering and Mathematics (STEM) professionals, while thousands of students will watch via webcast from their classrooms. This entry was posted in News, Science, STEM and tagged Houston Methodist Research Institute, MIchael Lunceford, pumps and pipes, STEM on December 4, 2015 by HISD Communications. Health professionals from Houston’s Health Museum visited the Mickey Leland College Preparatory Academy for Young Men and gave 20 ninth-graders a lesson on nutrition and physical fitness. The museum’s STEM Cells Sports Medicine Program exposes students to various disciplines within sports medicine. This entry was posted in News, Science, Special events, STEM and tagged DeBakey Cell Lab, Health Museum, Mickey Leland College Preparatory Academy for Young Men on December 3, 2015 by HISD Communications.